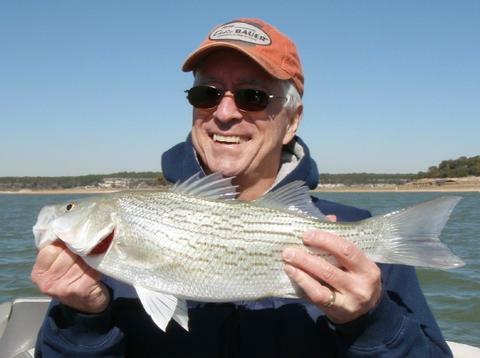 I fished a half-day morning trip today with brothers Larry and Keith H. The two chose a lake located half-way between them (San Angelo and Houston) and I was the lucky fellow who got to take them out. 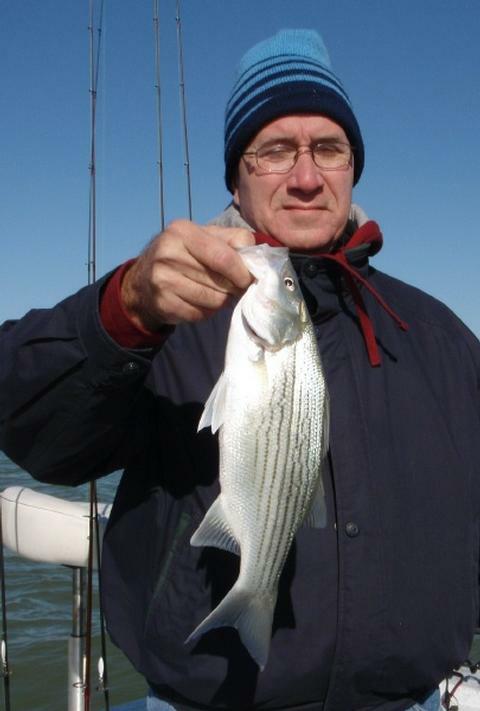 Larry holds our best fish of the day, a 3.75 pound hybrid striped bass that hit his 3/4 oz. TNT 180 slab. Keith poses for a quick shot of one of the many short hybrids we boated today before immediately releasing it. Short or not, these 16-17 inch hybrid put up a great fight on the medium-light spinning tackle we selected. Although we do have some resident birds (gulls and terns) on Belton now, they weren’t all that helpful early in the morning today as they have been. At 7:20am, just as the sun began to brighten the water, gulls began to circle a bit, but then settled right back down and didn’t give many clues. We downrigged in the vicinity of Area 024 and picked up 2 white bass but then hit into a dry spell. I witnessed another boat in the vicinity of Area 302 boating fish briefly, but didn’t want to crowd them, so we left that alone and continued the search. We struggled for a good while, but then around 10am, things began to turn around. The S. wind reached its peak velocity for the morning, and we began to graph some fish (most suspended ~3 feet off bottom)just NW of Area 080. We stopped and jigged here, picking up one crappie, but, based on the number of suspended fish I was seeing on sonar and the fact that they were responding sluggishly to a slab, we went with a downrigging approach. Once the downriggers were in and we began to cover some ground, we found suspended fish and bait all through this area from NW of Area 080 to Area 133, all in 19 to 26 feet of water. We boated 7 fish on the downriggers in no time, including white bass, hybrid striper, and largemouth. As we moved along, the shallower we got, the closer the fish were hanging to the bottom. Once we got to 19 and 20 feet deep, the fish were belly on the bottom. This again demanded a slabbing approach, so, I buoyed a congregation of fish and we went to work. Over the next hour, we boated 24 more fish, again including white bass, hybrid striper, crappie, and largemouth bass. At first, a smoking retrieve did the trick, then, as the fish slowed down, a jigging approach worked best. We finished up the trip around noon with making another couple downrigger passes after the fish quit hitting the slab altogether. We boated two last small white bass on large Pets and then called it a good day. Wind: Winds were S at 7 at sunrise, increasing to S13 at it’s peak around 10:00-10:45. Skies: Skies were bright and clear today.